The School Breakfast Program, like the more familiar National School Lunch Program, provides subsidized meals to school children. Researchers have found that eating a nutritional breakfast at school improves students’ academic performance, reduces disciplinary problems, and increases the likelihood that students eat a healthful meal. Unfortunately, when it comes to reaching children from low-income households with this program Iowa has long ranked near the bottom of states. On an average day in October 2013, Iowa served approximately 40 free and reduced-price breakfasts for every 100 free and reduced-price lunches. Based on a similar score, the Food Research and Action Center, a national nonprofit organization that studies hunger in the United States and advocates for nutrition and anti-hunger policies, ranks Iowa’s School Breakfast Program coverage as 47th out of 50 states and DC. Assuming October to be representative of the school year, our state’s poor performance means that thousands of low-income children in Iowa are failing to access this important program. What might explain this? And should we be concerned? 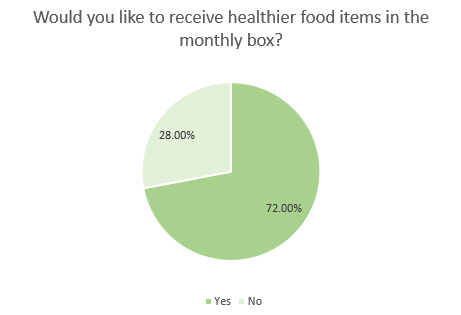 Of course, some families and children may not choose to participate in the program. But long bus-rides, increases in the number of school children in poverty, and the demonstrated benefits of the program means we should think through making the program as accessible as possible. 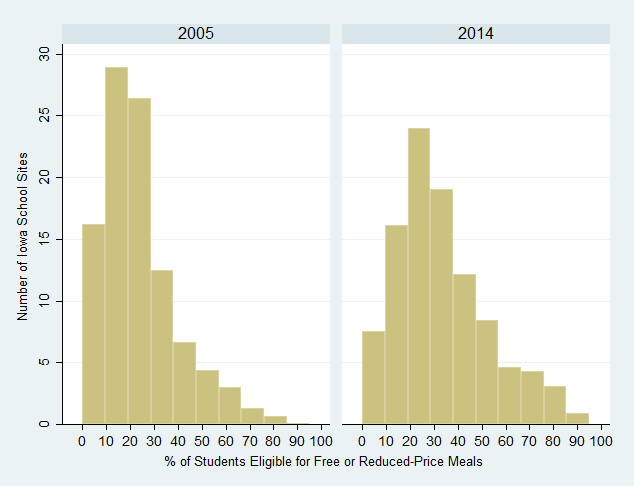 The figure below includes two histograms showing the increasing number of school sites (that is, elementary, middle school, and secondary schools) with larger percentages of children eligible for free and reduced-price meals. According to Census data, the percentage of Iowa school children from households at or below the poverty line rose by approximately 2.5 points during this period. Of course, as the state grows the absolute number of children in poverty grows as well (unless the rate were to fall). In the end, the rate increase and the growth in population means approximately 20,000 more students from families in poverty attend Iowa schools compared to just a decade ago.